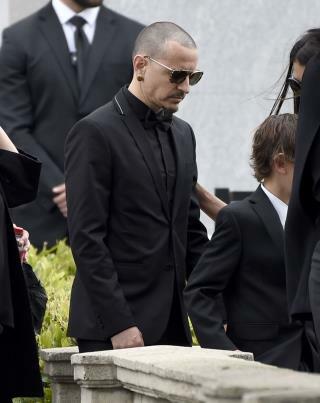 (Newser) – Another suicide in the rock world: TMZ reports Linkin Park frontman Chester Bennington has hanged himself. He was 41. The site's report comes via police sources who say his body was found before 9am local time at a home in Palos Verdes Estates, California. The Hollywood Reporter confirmed Bennington's death by way of the Los Angeles County coroner's office, which says it is investigating a "possible suicide" at his home. This dude had 6 kids? What a selfish prick. I don't discount that he may have had some psychological problems, but this very much seems like an attempt to try and make headlines by doing it on Chris Cornell's birthday. His band was past its prime and quickly becoming irrelevant, so it seems to me that this was his way of trying to become legendary like Cobain or Cornell or whomever. 30 million net worth at his death. Those who wish for a few million windfall would be well reminded of what important, happiness not wealth. They are not necessarily synonymous. Fortunately one you can control the other not so much.